Technostretch jacket with iridescent feather print. The print imitates the effect you see on a bird’s feathers. The jacket is made from a quick drying, stretchy fabric and the collar and cuffs are ribbed, Two zip pockets. You will be amazed by the transparent glitter print on the front panel of this jacket. The pale gold glitter tape on the sleeve provides a highly modern undertone. The jacket is made of quick-drying stretch material and features ribbed cuffs and collar. The collar is striped with gold lurex yarn. Sporty fleece jacket in 4-way powerstretch fabric for optimum freedom of movement. 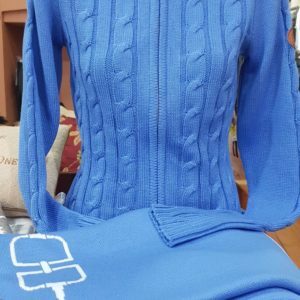 Beautiful cotton cable knit jumper with full zip. Available in two stunning colours, Cornflower Blue and Taupe. Sizes 34 (ladies 6), 36 (ladies 8), 38 (ladies 10), 40 (ladies 12), 42 (ladies 14).